‘Trombe walls’ were first patented by Edward S. Morse in 1881. In the 1960s, French engineer Félix Trombe and architect Jacques Michel developed and popularized the architectural element as an effective means to optimize heat gain and minimize heat loss during cold hours and avoid excess heat gain in hot hours. Heat from sunlight passing through glass is absorbed by and stored in a wall and conducted through masonry to condition interior spaces. Rooms heated by a Trombe wall often feel more comfortable than those heated by forced air because of the comfort provided by large warm surface radiating heat. For an 8-inch thick Trombe wall, heat will take 8 – 10 hours to reach the interior of the building. This thermal flywheel provides rooms with slow and steady heating for many hours after sunset, considerably reducing the need for conventional heating or removing the need for mechanical heating altogether. To wrap my head around how much heat a wall can store, I looked at published research and compared it to conventional fossil fuel furnace capacities. In 2016, researchers found that a Trombe wall in Mexico could store a maximum of 109 megajoules (MJ) on a cold day and 70 MJ on a warm day. This may seem backwards but think of the wall like a battery. In the morning of a hot day, the wall is already partially charged, and even if it’s a scorcher outside, the wall will eventually reach its storage capacity. Recall that joules are units of energy, not heat output. At the hardware store, a gas furnace’s capacity will be shown as heat output in units of Btu per hour. So, while a Trombe wall storing 100 MJ can store around 95,000 Btu, it will likely not provide the same heat output per hour to the space as a 95,000 Btu/hour fossil fuel furnace. 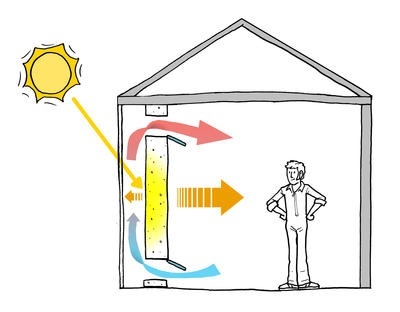 A single passive solar wall cannot replace a gas furnace, but it might allow for smaller furnace sizing, as exterior zones can be heated by Trombe walls alone, and a Trombe wall requires no maintenance or replacement. For example, the Visitor Center at Zion National Park has used Trombe walls to supply 20% of the annual heating for the building since 2004. The basic Trombe wall design includes a south-facing, uninsulated wall made of a thermally massive material – usually concrete poured to a thickness of anywhere from 4” to 16” – and a layer of glass (see Figure 1 above, left). The wall is often painted a dark color – usually black – to maximize solar heat gain by reducing the amount of infrared energy radiated back through the glass. Typically, the glass layer is separated from the wall by at least an inch, so a small air space is created to trap solar radiation and increase the heat gain of the wall. A modified Trombe wall design includes an expanded air space that functions as a habitable area, like a sunspace or greenhouse. Additionally, thermally massive floor construction can be used to increase heat gain (see Figure 1 above, right). 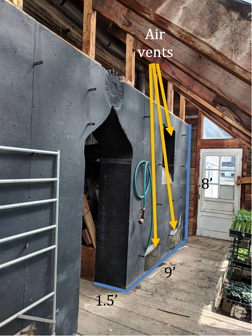 For added functionality, upper and lower air vents can be installed to create a convection loop to allow for heat from the air space to enter the occupied space (see Figure 2 below). These operable vents can be covered to prevent reverse convection currents from cooling occupants at night and to control instantaneous heating situations. Stick around for the end of this blog where I cover tips for effective Trombe wall design and construction! 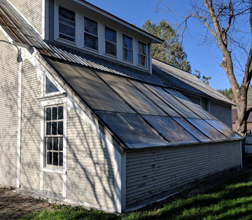 In June 2017, my husband and I purchased property in Huntington, Vermont that includes a barn and attached greenhouse (see Figure 4 below). To my delight, I discovered that the previous owner installed a Trombe wall along the south-facing back wall of the greenhouse. As an architectural engineering student, I never dreamed of owning one of these pieces of passive solar history. Now that I do, I could not resist rolling up my sleeves and bringing this retro wall into the 21st century. The greenhouse was built as an addition to the existing workshop in the 1940s. In the 1970s, the previous owner built the Trombe wall. It is made of poured concrete which was painted black (see Figure 4 below). The wall is split into two halves, which are connected by an archway at the greenhouse door. Each half is eight feet tall, nine feet wide, and one and a half feet thick. The wall is vented, like the drawing at the right of Figure 2 above; each half of the wall has one upper air vent to provide warm air to the attached workshop. The upper air vents each have a mechanical fan to increase convection, but these fans are in disrepair and do not operate, so the wall currently uses no energy for its operation. Each half of the wall also has two lower air vents to exhaust cooler air from the workshop into the greenhouse to be reheated by the wall. Trombe walls are particularly well-suited to sunny climates that have large diurnal temperature swings. Vermont is not the sunniest state in the country, with around 160 sunny days a year. In energy terms, Huntington, Vermont receives an average solar irradiance of 3.5 kWh/m2/day, which is half that received by Santa Fe, New Mexico. On the other hand, homes in Vermont do experience wide temperature swings between daily highs and nightly lows; from late March to mid-May, Huntington weather averaged 19 °F diurnal temperature differences. So, while my Trombe wall does not see direct sunlight every day, it gives the greenhouse a great benefit by keeping the space temperatures from lowering as severely as outside air temperatures when they dip each night. Details of frost protection are included in the results section below. Huntington, Vermont is in zone 4B of the USDA Plant Hardiness map, which corresponds to a last frost date of May 15th. Having moved to Vermont from California, at the end of March this year I was growing impatient to start seeds but worried that my hastiness would result in frozen soil. Naturally, I grabbed a few HOBO data loggers from work and decided to conduct a measurement and verification experiment to determine the average temperatures of the greenhouse during the day and night, the lowest overnight temperature by day of year, and the outside air temperature and corresponding day of the year at which to begin seed starting. At the end of March, I set up loggers in the greenhouse and in the workshop to record space temperatures and a logger on an exterior windowsill of the workshop to record outside air temperature. Studies in 2010 and 2017 found that when a Trombe wall is used in a greenhouse application, the mean temperature of the indoor air and soil increased between 2 – 7 °F on winter nights. With this hypothesis in mind, I expected to see a comparable difference between the overnight space temperatures of the greenhouse and the outside air temperatures. The meters gathered data for a 50-day period from March 26 – May 15, 2018. Overnight temperatures frequently dipped below freezing in late March and throughout April. Half of the nights and early mornings in April featured freezing temperatures, the coldest of which reached 16 °F. Some of these cold temperatures corresponded with instances of snow; during the metering period, it snowed in Huntington four times with a maximum daily accumulation of 1.6 inches on April 6th! The latest occurrence of snow was April 15th, and the latest date with freezing temperatures was the morning of April 23rd. Any seedlings sowed outdoors during these months would have died painful deaths. Frost protection was my primary concern when beginning this experiment; I wanted to ensure that my plants will be safe from frozen soil if I start seeds in late March in my greenhouse each year. I was interested in learning if I might be able to start greenhouse activities even earlier, if the Trombe wall is more effective than expected. From 8 pm – 7 am, average hourly greenhouse temperatures were 6.2 °F higher than average hourly outside air temperatures (OAT). When overnight OATs are below freezing, greenhouse temperatures were an average of 9.7 °F warmer than OAT. Unfortunately, greenhouse temperatures did dip below freezing on a few occasions in early April when we had snow and OATs fell to the high teens. However, these instances were rare; greenhouse temperatures were below 32 °F for only 16 hours out of the 1,200 metered, an equivalent of 1.3% of the time. The table below shows the minimum recorded daily OAT and greenhouse temperatures for each month of the metering period. The April snowstorms were the reason for the lowest greenhouse temperature of 27.6 °F. 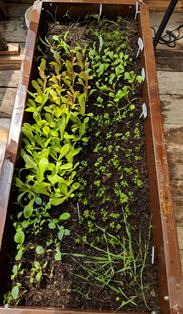 Fortunately, my seedlings survived the freezing temperatures, which indicates to me that there was no harm in starting them when I did. Figure 5 below shows my seedlings at the end of the metering period. However, I learned that I probably cannot start seeds any earlier, as we received the most snow of the winter in mid-March, so freezing greenhouse temperatures would be more likely then, and overnight OATs would also probably be even lower. The seeds might not survive, and I will not take the risk. This experiment showed me that I am able to extend Vermont’s growing season by at least eight weeks using no energy at all, which is a considerable advantage in a region with a very short season. I was also curious how much warmer the Trombe wall makes the greenhouse during the day. Maybe I could grow bananas! During the hours of 10 am – 2 pm, the average hourly greenhouse temperature was 16.8 °F warmer than average hourly OAT; the average greenhouse temperature was 69.8 °F while average OAT was 53.0 °F. Looking at all daylight hours, 7 am – 8 pm, greenhouse temperatures were on average 10 °F higher than OAT; that is remarkable, but I guess there will be no bananas for me. Planning for the hotter months of summer when OATs exceed 90 °F, I am slightly concerned that temperatures in the greenhouse at mid-day might get too high and overheat my plants. For this reason, I will be installing a shading device to prevent the wall from receiving solar heat gains from mid-day and mid-summer sun. When temperatures get very warm in the greenhouse, even if I install a shading device for the wall, what else can I do to prevent overheating? Should I install new fans to exhaust heat into the warehouse when temperatures exceed a high limit temperature of 95 °F? Could I instead install a hydronic loop that transfers heat from the wall to a storage tank of water or phase change material? How will the thermal flywheel change with longer summer days? What opportunities are there for automation and controls so I can monitor outdoor and greenhouse conditions in real time? Analyze the incidence angles of the sun in summer and winter for your location to determine wall size, placement, and shading considerations. Use high transmission glass to maximize solar gain to the wall. Coat the wall in a dark, heat-absorbing material. If the wall does not serve a sunspace or greenhouse, ensure interior surface of wall is open to interior zones and is not obstructed by cabinetry or bookshelves. If possible, insulate footings to prevent heat loss to the ground. Properly size roof overhangs to shade the Trombe wall during summer when heat is not needed. Install temperature sensors to monitor wall performance and interior space temperatures of rooms conditioned by the wall. Consider integrating control devices into the greenhouse to manage extreme greenhouse temperatures. Have you ever designed or seen a Trombe wall in person? Was it in a residential or commercial application? Please share your stories below.